The AJRC publishes the AJRC Working Papers, previously the Asia Pacific Economic Papers. This series contains the latest research and analysis from the AJRC and affiliated scholars. While the working paper series focuses on Japan’s economic development, it also features issues on the political economy, regional integration and trade. The series aims to provide a forum for the exchange of topical research which is disseminated to a specialised audience of researchers and libraries throughout the world. AJRC Working Papers are published in freely accessible online on the AJRC website as well as online repositories including RePEc and SSRN. Previously the AJRC published the Asia Pacific Economic Papers (APEP) on behalf of the Crawford School. This series has now been replaced by the AJRC Working Paper Series, but old papers are still available via RePEc. Past AJRC Annual Reports can be accessed on the AJRC website. As of 2013 the Centre produces smaller, electronic biannual reports on our activities which is distributed throughout our network. To join the AJRC network, subscribe online. Australia and Japan in the Region (AJIR) is a monthly publication produced by the AJRC. focussing on Japan’s role in the region, on Australia-Japan interactions and on regional issues of significance to both countries. AJIR encourages input from Japanese scholars, as well as presenting ongoing and new research from the Crawford School and from AJRC’s associated researchers and partners. Subscribe to the Australia and Japan in the Region. The AJRC together with the East Asia Forum produces special edition each year a of the East Asia Forum Quarterly (EAFQ) on Japan. The most recent edition is Reinventing Japan (Vol. 8, No. 3) published in September 2016. To remain a wealthy, peaceful, high-tech advanced society, business as usual in Japan will not do. Japan needs reinventing. A shrinking and ageing population has made priorities of two issues—maximising the potential of women in the workforce, and the need to have a serious debate about immigration. The Abe government has brought political stability, but without an effective opposition, the health of the political system is under question. Japanese companies need new dynamism to re-establish themselves as global corporate leaders. To effect the changes that are needed will require Super Mario strength and determination. Find other previous editions of East Asia Forum Quarterly on the EAF website. 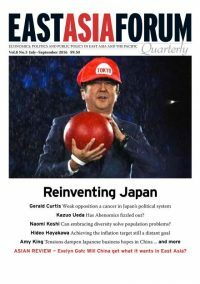 Subscribe to the East Asia Forum Quarterly.